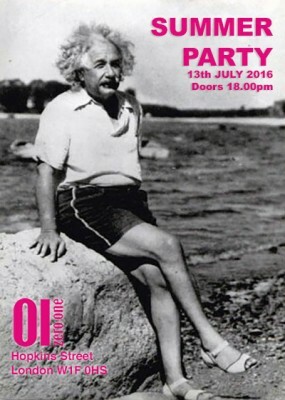 13/07/2016 Summer Party at 01zero-one! We are setting a summer party where we are going to show the best of the year from our screening events.This time, we are inviting our clients and new companies to come along and discover what we do and who we are at 01zero-one so it will be a good chance to do some networking and meet people working in the media industry. As usual,we will invite as well members of the crew of the films so we will have the chance to talk with them and so some Q&A but it will be an event mainly based on networking. This is a free event but if you have a drink from the table please do a donation of minimum £1 to cover the cost of the drinks and to maintain this event for free. Sophie’s Story uses animation to describe an often disjointed and surreal journey from a background of domestic abuse and troubled adolescence into adulthood and family and examines what constitutes the catalyst for change along an incredible life journey. Bobby Yeah is a BAFTA-nominated stop motion animated short film written, directed and animated by Robert Morgan. It was made independently and completed in 2011. It has screened at numerous international film festivals, including The Sundance Film Festival. The story of Shmilu, a Hasidic Jew in crisis, torn between his community and the romantic possibilities of trendy East London.The first fictional film made with the UK’s Hasidic population, including non-professional actors and Yiddish dialogue —- © 2015. A sizzling summer home grown special. Cream tease is a 2D film that is set in the 80’s during the height of a hot summer. Innuendo abound, this isn’t for the faint of heart, but it all wraps up not as you would initially expect. Beverley follows a mixed-race girl’s struggle to carve out a sense of identity in a confusing, shifting cultural landscape – 1980 Leicester. A move from the decaying, poverty-stricken, urban environment to the relative comfort and theoretical safety of white suburbia does not provide the hope and opportunities Bev may have wished for. A familiar enemy is ever present – a threat that extends beyond her own safety, as she must also protect her brother and sister. By asserting her will and using her guile Bev tries to shape her new environment into something palatable, but the result is the opposite of what she is trying to achieve.